Hello everyone, Yes yes, I'm asking one of the "taboo" questions I guess. 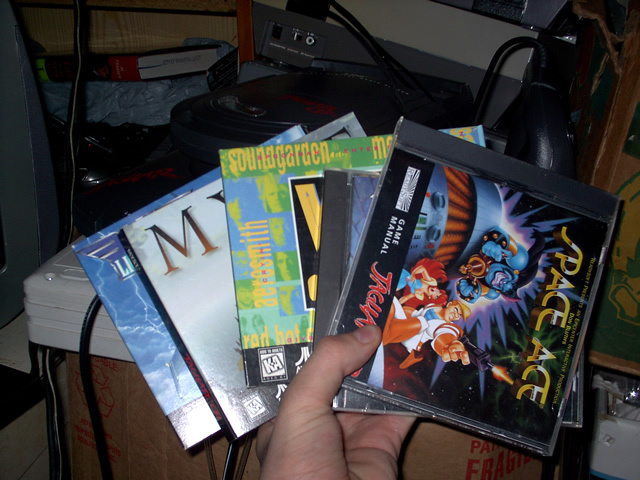 How do I make backups of these games and then burn them to CDRs? would go "ooh pirate eval eval!" I can put the real copies away for safekeeping. I've found NTI Platinum session only recording works the best. Some will copy with Clone CD as well, but not all. Is there anything fancy I need to do? No special settings for the jaguar? Just tell it to duplicate and let it go? hey i'VE BEEEN LOoKing FOR THESE! tHANKS! will work better with my JagCD. It's the first time I've had the problem. The way I back up my Jaguar games (I only have Blue Lightening and Myst , and BIWN but that's a backup already ) is with the program called Alcohol 120%. I just let it create an image of the cd and then burn it to a cd. Wonderful program . I use Alcohol for my other image burning needs, but it is ineed quite a good program. Mega Man, Mega Man, does whatever a Mega can! When you own literally hundreds and hundreds of disc based games (not just Jaguar) those D-Skins become highly impractical. Look how much one costs and multiply. If they sold them in 50 packs for $10-$15, then I'd start using them. Wow! It's like a condom for your cd's. and Nero failed too. The backup indeed works, and original still fails. These "CD condoms" haven't made it to the UK as far as I can see. Does anybody have good experience of any of these "CD skimmers"
is now damaged, and with Telegames prices I'm now IS-II CD-less. I wish I'd made a backup, but normally I take great care of Jag stuff! Virgin used to sell them, they might have stopped. They seem a bit faddy and could be difficult to apply...looks liek consumers voted with their feet. (even of the UK) have that sort of thing. They're just like warehouses. I wonder if a large Dutch one might have the same equipment. Hmm. Anybody else in Netherlands had any luck with these? for sure has dedicated options for Playstation CD's etc., and is ~ $50. Try it. My local one's like that (went in to get an Xbox pad) but they have a service area off to one side where they keep all the games - the box they sell you is empty and you go off to one side after paying for it to redeem it for a shrinkwrapped version. The service area had a seperate queue area and a little sign up advertising resurfacing.